High-Powered Brushless Aircraft Motors from O.S. Pilots loyal to outstanding O.S. performance but eager to fly electric will now have the ideal option — powering electric airplanes using new O.S. Brushless Motors! 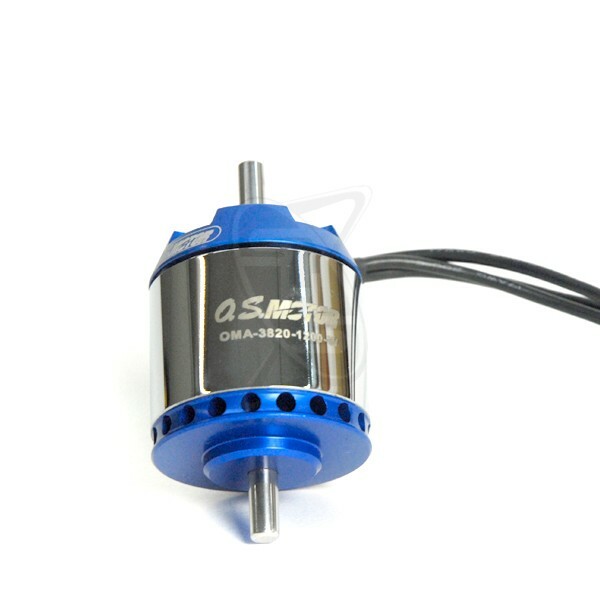 The OS OMA-3820-1200 High Performance Brushless Motor is designed equivalent for 2-stroke 25 size airplanes. Designed by O.S. engineers to be the new "gold standard" in electric power, these motors offer the same legendary quality and reliability that have made O.S. glow engines famous worldwide for 75 years. Initially, the motors are being produced in 6 sizes, equivalent to .10,.15,.25, .30, .40 and .50 size glow engines. Only O.S. brushless motors will offer a ventilation system that increases efficiency and allows the motors to generate additional power. Key to this system is a unique centrifugal fan design. The fan draws air through specially angled ventilation holes, across the windings and over the magnets for greatly improved cooling. With the introduction of these brushless motors, O.S. reaffirms its standing as R/C's most innovative and respected resource for all model power needs. O.S. plans to expand its motor lineup in the near future with more sizes and choices for car, helicopter and ducted fan modelers.